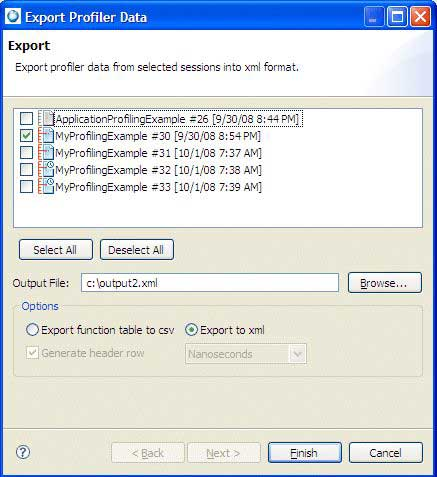 You can export Application Profiler sessions to XML files if you want to share profiling results. You can also export function table data to CSV files if you want to view the data in a spreadsheet application. The XML files generated by the export feature are self-contained, meaning you can later import that profiling data into another IDE workspace or installation without having to name the file paths that store the application binary and dynamic libraries. In the Profiler Sessions view, click the Export Application Profiler Session icon ( ) in the toolbar, or right-click within the view and choose Export. In the Export window, select the sessions from which you want to export data. The profiling sessions all listed from oldest (at the top) to newest (at the bottom), with checkboxes for selecting individual sessions. There are also Select All and Deselect All buttons. In the Options panel, choose the output format. By default, the Export to xml radio button is selected, which means all session data gets written to one XML file. If you click Export function table to csv, the fields underneath become active. You can check Generate header row to include column headers that display field names in the output file. The dropdown on the right lets you choose the time unit for reporting function runtimes. In the Output File field, specify the file for storing the data. You can enter an absolute host path or click Browse to choose a directory from a file selector. You must enter a file name in the selector window. The file extension is preset depending on which radio button is currently selected in Options. The IDE writes the data from the selected sessions to the output file, in the format indicated by the Options panel. If you specified an existing file, the IDE asks if you want to overwrite it. For XML files, the session data stored in them can be imported into a different IDE installation, even one of another version. For CSV files, you can view the function data in a spreadsheet application such as Excel.